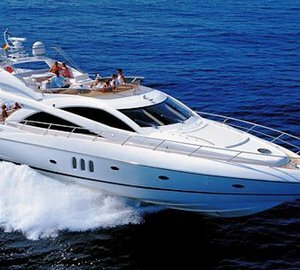 Luxury motor yacht KOKO is a Sunseeker Manhattan 66 built in 2006 and is available for charter in the Mediterranean. 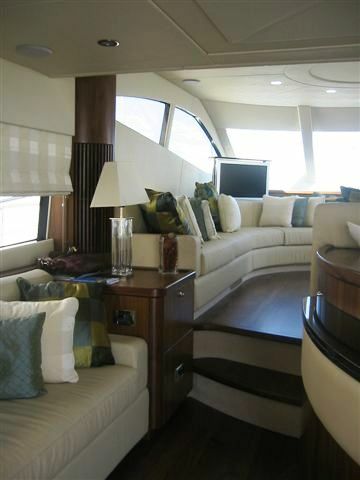 Unlike many other Sunseekers, she has been fitted out with modern wooden floors and cream leather sofas giving her an elegant and chic Italian atmosphere. The saloon is extremely spacious as the interior stair case has been removed allowing for extra room for the lovely comfortable sofas. The saloon also has a rise and fall 32 inch flat screen television which is linked to satellite TV, and there is also a huge DVD and music library with a wide rang of movies and songs to choose from. 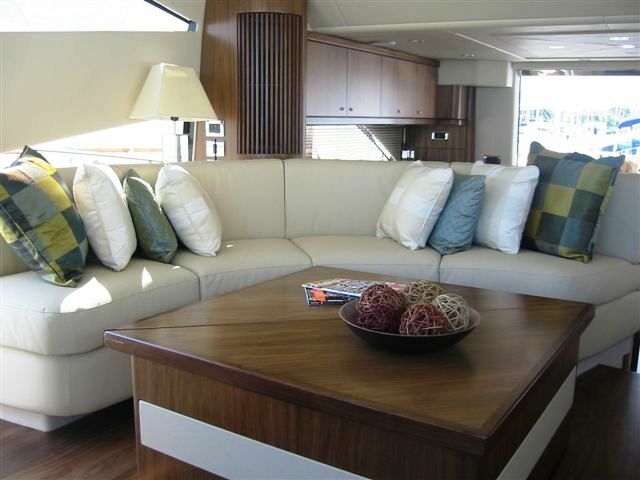 The defining feature of this luxury Sunseeker yacht is its flybridge – it has teak floorings and a lovely rise and fall teak table along with spacious seating and sun bathing cushions for relaxation and dining! This area can be fully covered by a bimini cover, and there is also a BBQ on deck, along with an ice maker and cool box just to top it off! 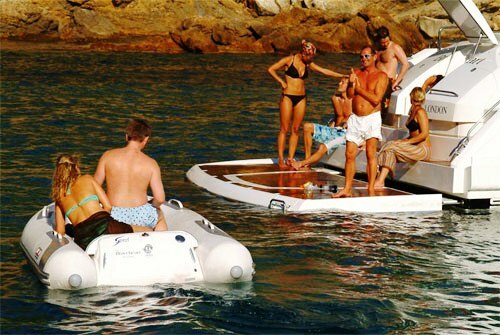 Koko also has a hydraulic swimming platform (please refer to photo below) making it extremely easy to swim off into the blue water of the Mediterranean. 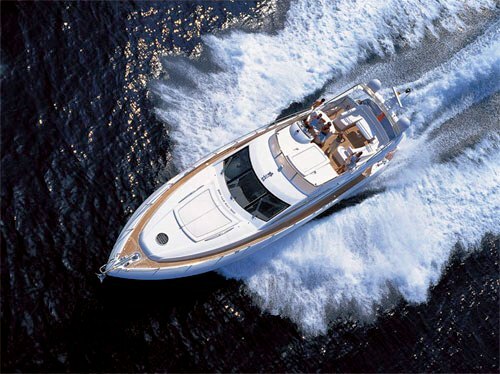 There are three luxurious cabins on board luxury motor yacht KOKO. The master and VIP cabin are both double while the third cabin is a twin. 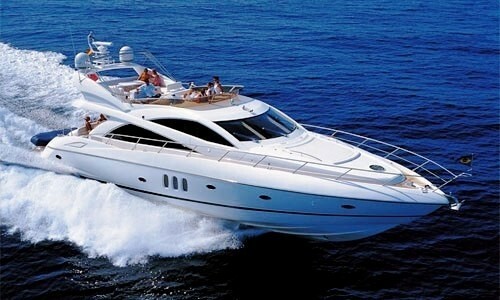 Come and enjoy a fantastic and fun luxury yacht charter on board KOKO! 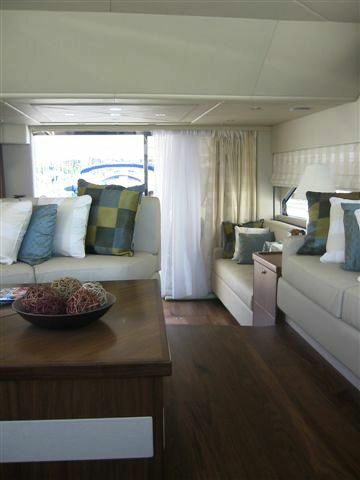 The Master Cabin is full width and has a king size bed, with a sitting area and comfortable lounge and dressing table. 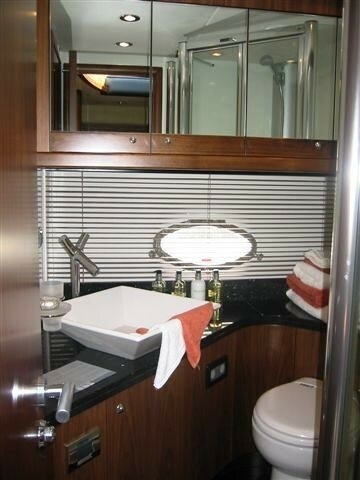 There is also a private ensuite with a walk in dressing room. The VIP is a double room, and the third cabin has twin beds - both have private ensuites. The crew have separate quarters. There is a Play Station and TV in all guest cabins. Fully air-conditioned, 1 x Yamaha Jet Rib 80hp, Waterkis, donut, Snorkelling equipment, rise & fall 32inc flat screen TV in saloon, Satellite TV, CD, DVD surround sound system, flat screen TVs in all cabins, Playstation in Guest cabins, anyport wireless broadband.